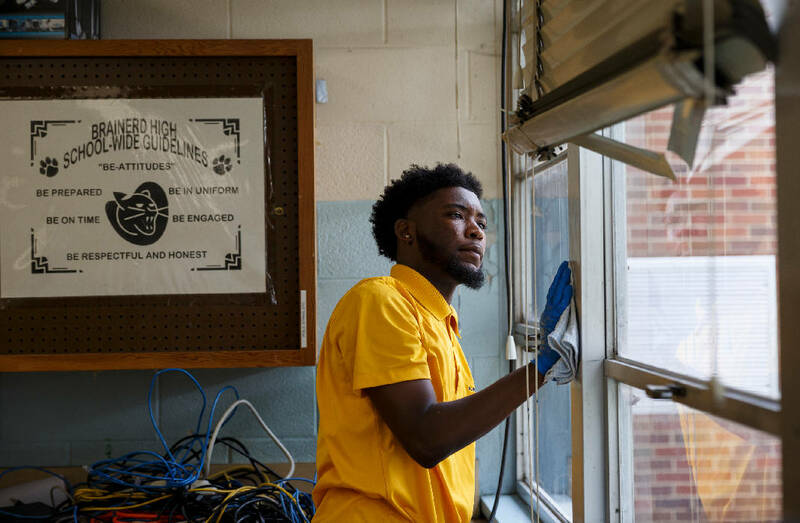 Jalen Hunt wipes down a window frame during a volunteer work day at Brainerd High School on Saturday, July 7, 2018, in Chattanooga, Tenn. Students with the University of Tennessee at Chattanooga's Bridge program as well as volunteer alumni and other community groups came out to help maintain the school's campus. Generations of Brainerd High School graduates, students and other community members gathered at the school Saturday for the third workday in an ongoing effort to spruce up the campus. Last month, the Brainerd High Alumni Association launched a beautification project and invited other organizations to join alumni in cleaning, painting, putting down mulch, and planting trees this summer. "It keeps the school growing," said Mary Johnson Jackson, a graduate of the class of 1978. "It keeps us together as a community family. Not everyone can donate money, but everyone has time, and that's what these students need." Recently, the alumni association celebrated its 12th annual alumni picnic and Johnson Jackson's class held its 50-year reunion. Principal Chris James, who was hired in February to lead the school, said having an active alumni base has been beneficial for the former Knox County educator and has helped him get to know the community. "Brainerd alumni have their hands in everything in town," James said. 'They have been an asset in helping connect me with people in the community." As for the beautification project, James called it "a culture builder" for the school's students. "You take pride in what you see, you take ownership of Brainerd," he said. Recent graduates also worked alongside Brainerd alumni Saturday. Rykiedra Finley, 18, graduated from Brainerd only a few weeks ago and is now participating in the University of Tennessee at Chattanooga's Summer Bridge program. "I'm happy to see them doing something different here," Finley said. "I was excited to see what we would be doing it makes me feel better to help people." Finley, who plans on majoring in exercise science is one of 27 participants in the bridge program which is funded by UTC and the state through a Talent, Innovation and Equity (TIE) grant. The program is geared toward first-generation college students, students from low-income households or others who might need additional support during their first year. During the five-week program, students earn seven to eight credits, attend class daily, participate in community service projects and go on outings around Chattanooga. "This is a support program," said Kim Wingate of UTC's School of Education, who is co-director of the Summer Bridge program. "We are here to help support students as they transition to UTC. It's giving them the opportunity to step in early for their freshman year." This Saturday was the group's first community service project, arranged by Wingate, who is the wife of school board member Joe Wingate of District 7, after the alumni association approached the group about participating. About half of the program's participants are from Hamilton County, but many of them attended schools like Red Bank High School, STEM School Chattanooga and the Chattanooga Center for Creative Arts. For Truely Cervenak, 18, it was her first time visiting Brainerd, though she graduated from Red Bank High School this year. She was enthusiastic about helping a local community she wasn't very familiar with. "I think it's great [to be here]," she said. "All through high school I tried to be involved in my school. I like helping people." As Johnson Jackson and other alumni worked alongside the recent graduates, they reminisced about their own time in high school decades ago. "These trees out here, when we walked the courtyard, the trees were so thin," she said. Johnson Jackson's two children are also both graduates of the school — "it's a family legacy," she said. Her sister, Pam Johnson, graduated with the class of 1982. She praised the work that the association does to support the school community. "It's a community thing. If you love Brainerd like we did, you will come back and help," Johnson said. "You don't want to see your school fail, you don't want to see your school fall apart." The association holds an annual banquet, gives out scholarships to Brainerd students, hosts teacher appreciation breakfasts and more. "We party with a purpose and we work with a purpose," Johnson Jackson said. "And our purpose is the children." The association is hosting one more beautification workday this month from 9 a.m. to 2 p.m. on Saturday, July 21.